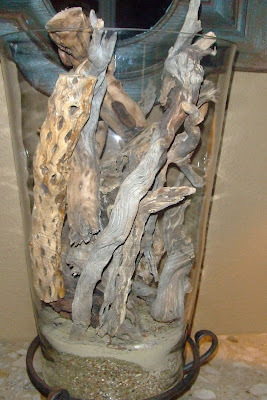 About a year ago I started collecting old pieces of driftwood. I figured that one day I'd display them in a large glass urn and it would make good art and good conversation. I found them on our camping trips during our walks & hikes,and some on several of our latest beach trips. Well, my collection is complete and I think it looks stunning. I added different layers of similar color sand and rocks to the bottom of this glass urn to add a "beachy" feel. Any outdoor elements that are incorporated indoors is a refreshing way to add life to your home. 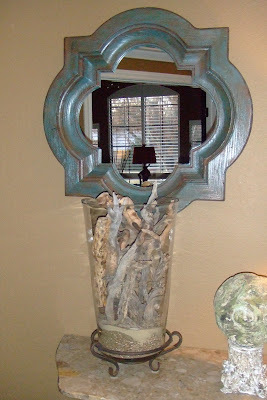 This mirror was found at a thrift store and my faux artist friend painted it for me in this awesome rustic patina.